The Harwinton trails have been an underused as a mountain bike destination until last year when NEMBA partnered with the town to design mountain bike specific trails on town property. At Harwinton Recreation Area, three MTB specific trails were built to augment the multi-use trails already in existence. The terrain varies and includes flowing switchbacks, rock gardens and log bridges through young forests and old growth pine and hemlock groves. 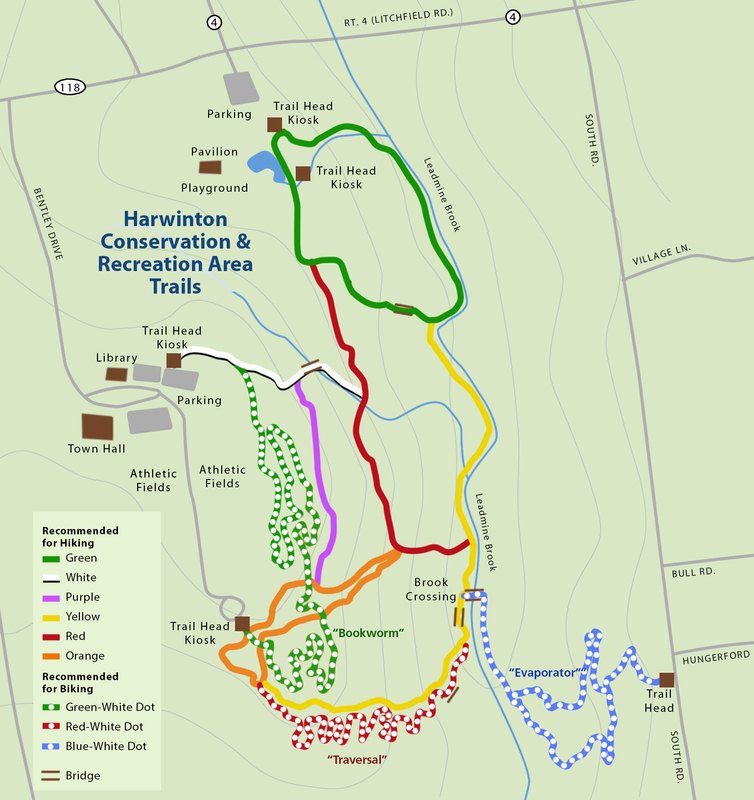 Adjacent to the Harwinton Recreation Area is the Roraback Wildlife Management Area (RMA) where there are many additional miles of single and doubletrack trails. The trails in RMA are as scenic as they are fun. There are trails following each of the brooks (Rock Brook and Lead Mine Brook) that wind through the forest. There are several small ponds and the larger Valley View Pond where you can ride the double track across the dam and get a spectacular view. There is even a section of an old cobbled path along the Lead Mine Brook. You may be lucky enough to see some of the plentiful wildlife: deer, bear, beaver, coyote, bobcat and turkey. To access Harwinton Recreation Area, park at the Harwinton Town Hall or Library and bike out to the end of the soccer field complex. (It’s best not to drive out as they may lock the gate behind you.) You should see the small kiosk at the trail head. The mountain bike “preferred” trails are marked with a white dot: green/white, red/white and blue/white. There are several access points for the RMA trails on South Road and Swimming Hole Road. The closest access from the Rec. Area would be to take South Road to Swimming Hole Road then park in the parking lot about one half mile down on the left.